Bring a large saucepan of water to the boil. Trim the asparagus so that they have 8cm-long stems (excess stems can be used to make a delicious soup) then wash and drop them loose into the pan of boiling water and cook for 4-5 minutes or until tender. Remove and drain before spreading them out on plates to cool. This maximises their flavour. Meanwhile, place the quail's eggs in a pan of cold water. Bring up to the boil, remove from the heat and leave to stand for 30 seconds, then peel under running water. Whisk together the mustard, garlic, seasoning, vinegar and olive oil. Put the salad leaves, sorrel and watercress in a large bowl. Pour half the vinaigrette over the salad and gently mix before dividing between six plates. Toss the asparagus tips with the remaining dressing and add to the salad. 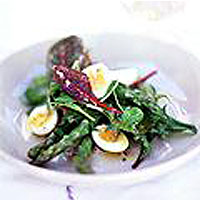 Cut the quail's eggs in half and slip 4 halves into each salad. Serve immediately.